Natina Reed of the 90's group, Blaque has passed away this morning in Atlanta according to several reports. Natina was the spitfire of the group (rapper), and also an actress. She starred along side Gabrielle Union in the original Bring It On movie. This tragedy takes place on the eve of her 33rd birthday. Right now details are sketchy at what happened, but reports are saying that it was a possible hit & run that caused the untimely death of Natina. She does leave behind one child, a 10yr. old son, by rapper Kurupt, formely of Tha Dogg Pound. It's so funny how things go...I was at an event in Atlanta that Blaque hosted in memory of TLC's Lisa "LeftEye" Lopes (the founder of the group Blaque), and actually got to see Natina & Brandy. According to author Tionna Smalls (What Chilli Wants consultant), Kurupt confirmed that Natina has indeed passed away. 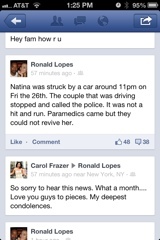 Update: Ronald Lopes via FB has this to say concerning the hit & run concerning Natina's death!